Achieve 4th of July appetizer glory with these creative Eagle Mini Cheese Balls. 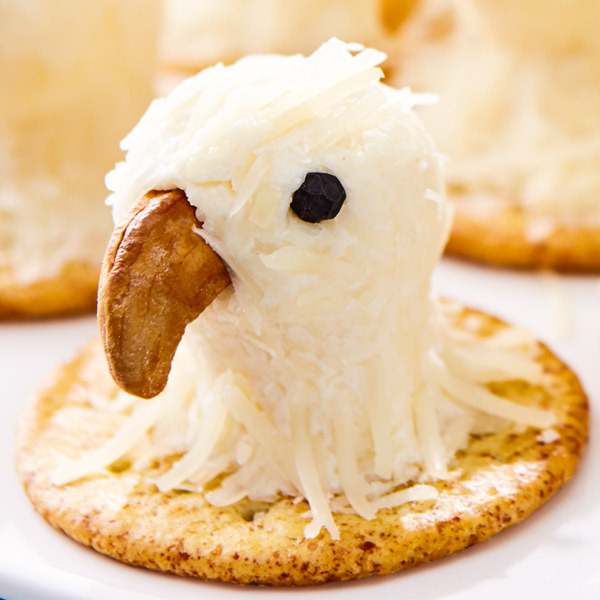 Made with cream cheese, shredded white cheddar and Parmesan cheese, cashew beaks and peppercorn eyes, our tasty cheese ball recipe is easily transformed into a convocation of incredible-edible eagles. Round crackers provide the perfect perch for these bite-size mini cheese balls. These fun 4th of July appetizers are easy to assemble, so invite the kids to help create some patriotic party food that's sure to get as many “oohs and ahs” as your fireworks display! In a large bowl, mix together cream cheese, cheddar cheese, onion powder and garlic powder with an electric mixer. Chill in refrigerator for about 30 minutes. Spread shredded Parmesan in a shallow bowl or pan. Remove cheese mixture from refrigerator. Scoop about ½ tablespoon of cheese mixture into your clean hands and form a ball. Roll the ball in the Parmesan. Shape ball into a slight oval, and place atop a cracker. Add a cashew beak and 2 black peppercorns for eyes. Continue until you’ve run out of the cheese mixture.